After purchasing this product, you will be sent a unique Kogan Mobile vouchers by email within 24 hours and a Kogan Mobile SIM Starter Pack by post. If you are activating a new Kogan Mobile service, visit the activation centre to redeem a voucher. If you are already a Kogan Mobile customer, simply login to your account and use your voucher to recharge. 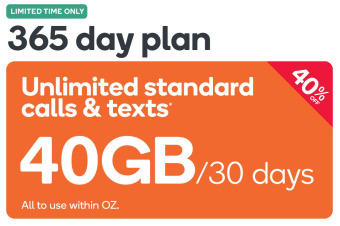 Each voucher can be redeemed for an EXTRA LARGE 365 Day Plan without any additional charge. Supersize your data on a 365 Day EXTRA LARGE Prepaid Plan for complete freedom to surf, stream and socialise to your heart’s content. The unique Kogan Mobile voucher included as part of this product is non transferrable and cannot be redeemed for cash. Voucher expires at 11:59pm AEST on 17/07/2019. Activation or recharge must be made before the voucher expiry date. Voucher does not apply to subsequent recharges. Voucher cannot be used in conjunction with any other vouchers or promotional offers. For information about how to use Kogan Mobile vouchers, click here.